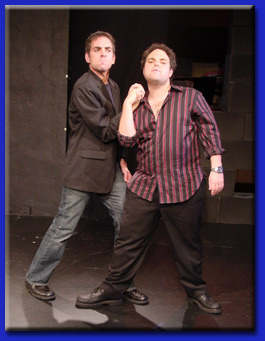 THEY improv provides conflict resolution workshops utilizing improv comedy, game shows and murder mystery dinners as well as activities such as workshops, scavenger hunts, mini-Olympiads, audience Olympiads and mental challenges. Overcoming internal issues is a vital part of the organizational landscape. Almost all companies suffer from some form of this problem. From passive aggressiveness from employees to full-out war between departments, management can not ignore internal conflicts and just hope that they resolve themselves. THEY improv provides a variety of options to help overcome internal conflicts and issues within a company and help various arms of a group to work together as a cohesive unit. Does your company spend more time talking about their problems than solving them? Is assigning blame becoming more important than finding solutions? Is your employee turnover increasing? Have the number of sick days increased? Have you, yourself, thought of looking for a new job? If the answer is "yes" to any of these, you have a problem. Team building workshops provided by THEY improv are enjoyable experiences for all and can help a new working group in their efforts to get to know each other and start moving towards their goals as a unit. Through laughter and shared experiences, stress is reduced and the team members get to know each other better. Most teams break down because they don't see each other as the human beings that we all are. Seeing each other in a new light promotes understanding and cooperation. After all, everyone advances better by working together. We have a wide array of team building activities from Scavenger Hunts to construction projects. Rather than choosing from a menu, our professional staff will discuss your needs and budget and help determine the optimum program for your company. 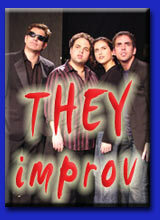 THEY improv can provide these workshops anywhere in the country. We have some pages that are specific to areas and you can use these links to access this more local information: Alabama, Alaska, Albany, Albuquerque, Anaheim, Anchorage, Annapolis, Arizona, Arlington, Atlanta, Atlantic City, Austin, Baltimore, Baton Rouge, Bethesda, Big Sur, Birmingham, Boca Raton, Boise, Boston, Boulder, Broward County, Buffalo, CA Central Coast, Central NY, Charleston, Charlotte, Chicago, Cincinnati, Cleveland, Colorado, Connecticut, Coral Gables, Dallas, Daytona Beach, Delaware, Denver, Detroit, DFW, Fairfax County, Fairfield County, Finger Lakes, Florida, Florida Keys, Fort Lauderdale, Fort Worth, Galveston, Galveston Bay Area, Gulf Coast, the Hamptons, Harrisburg, Hawaii, Hawaii Big Island, Hilton Head, Hollywood Florida, Honolulu, Houston, Idaho, Illinois, Indiana, Indianapolis, Iowa, Kansas, Kansas City, Kentucky, Key Biscayne, Key West, Las Vegas Strip, Las Vegas, Lexington, Little Rock, Long Island, Los Angeles, Westside Los Angeles, Loudoun County, Manhattan, Maryland, Maui, Memphis, Miami, Miami Beach, Michigan, Milwaukee, Minneapolis, Minnesota, Mississippi, Missouri, Mobile, Mobile, Monterey, Naples, Nashville, Nebraska, Nevada, New Hampshire, New Jersey, New Orleans, North Carolina, North Dakota, Northern Virginia, New York City, Ohio, Oklahoma, OKC, Omaha, Orange County, Oregon, Orlando, Pennsylvania, Philadelphia, Phoenix, Piedmont Triad, Pittsburgh, Portland, Puerto Rico, Rapid City, Research Triangle, Reston, Reno, Richmond, Rio Grande Valley, Sacramento, Salt Lake City, San Antonio, San Diego, San Francisco, San Francisco Bay Area, San Joaquin Valley, San Jose, Savannah, Scottsdale, Seattle, Silicon Prairie, Silicon Valley, South Carolina, South Dakota, South Florida, Southern California, St. Louis, Tampa, Texas, Tysons Corner, USVI, Utah, Vermont, Washington DC, Washington State, West Palm Beach, West Texas, West Virginia, Westchester County, Weston, White Plains, Worcester, and Worcester. Likewise, our professionals can travel for an additional fee to any other part of the country or internationally (though certain international laws must be adhered to, of course).